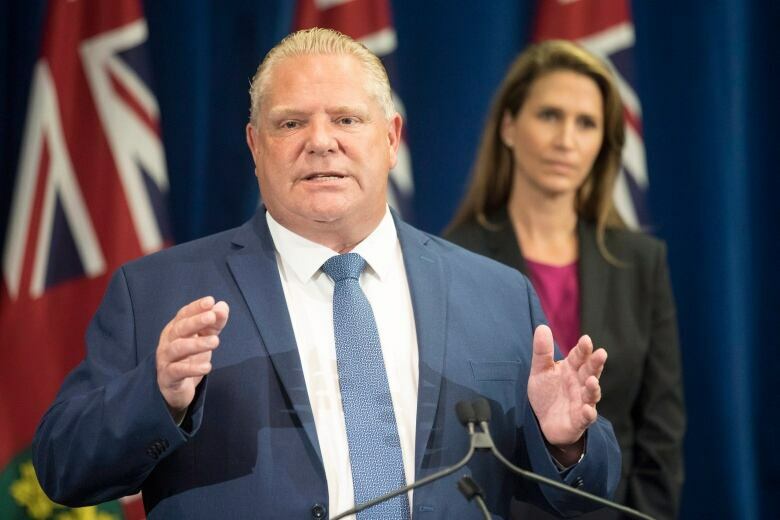 When reporters tried to ask Ontario Premier Doug Ford questions at a news conference about new funding to prevent gun violence, they were once again intentionally drowned out by applause. The premier's government was criticized last week when staffers applauded Social Services Minister Lisa MacLeod's announcement to scrap Ontario's basic income pilot program. Cynthia Mulligan, a reporter for CityNews, attempted to ask the government employees whether they were instructed to clap. She spoke to As It Happens guest host Matt Galloway about what she learned. Describe what's going on there. Why are those staffers applauding? Essentially, what they're doing is drowning out reporter questions. We are being kept under a very strict protocol, and even today I noticed it more so than usual. A Doug Ford spokesperson telling us over and over again, "You are only getting five questions in," and there are way more reporters than just five questions. At the end of the five questions — and this started during the campaign, actually — but at the end, when they say last question, staff at the back of the room start clapping. Reporters are still trying very hard to get more questions in ... but the clapping drowns it out for any live news feed, so it's not heard in the background. And again it happened today, but with way more staff in the back than I've seen before. I counted about 50. All young staffers and I'm told that they work in the different ministers' offices. Who's telling them to do this? I was trying to find that out today. They wouldn't answer the question. They sort of hurried away and didn't really want to talk to me, as you can see from the video. I was asking Attorney General Caroline Mulroney — she had acknowledged that some of her staff were there — but she said that she has not instructed any of her staff to do so, but she was not answering questions as to who is, you know, instructing them. How different is this from political announcements that you have covered in past? This is unprecedented. No government has done this before. I've never seen this before. There's always a testy relationship at times between media and governments. Governments don't want to answer a lot of hard questions. Media want to ask a lot of hard questions. So, there's always a little bit of a tussle in terms of finding a balance. But this is a different way of managing media. How does it affect your work in terms of being able to ask those questions that you want to ask? It makes it much tougher. There are always way more reporters than questions allowed, so you sort of have to try and weasel your way in to try and get your questions. I wanted to ask him about [the Toronto Anti-Violence Intervention Strategy] and I did. But he didn't answer the question, so I asked the follow-up question and his spokesperson said, "Well, that counts as a second question." And the rest of the media got quite upset because a follow-up has never really been considered question No. 2 before. 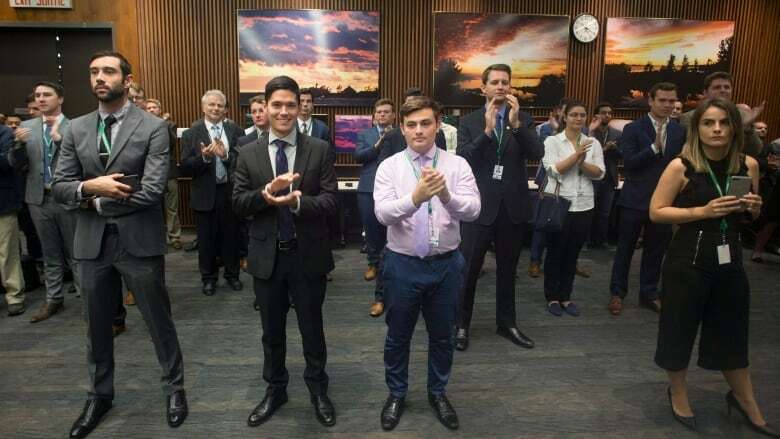 Your colleague, the journalist and host Steve Paikin, has suggested that these staffers who are applauding overtop of the journalists' questions should be named and shamed. Is that the way forward? I personally would rather find out who is instructing them, one, to be there, and two, to clap. I think that is far more pertinent to this issue because, look, they're young. These might be their first jobs — certainly at Queen's Park. They're probably trying to make their mark and work really hard for their bosses. I think it's the people who are instructing them that need to be held to account. The other element here is that as Premier Doug Ford recently unveiled something called Ontario News Now, which is a series of taxpayer funded videos — almost like its own channel — that pushes the government's agenda. ... How does that all fit in with what you're describing happening in the room this morning? It's so easy now for laypeople to create their own news video that I think what they're trying to do is skirt around us. Because they know we're critical. They know we're going to ask the tough questions and they want to reach their base unfiltered with their own message. Journalists might be upset about this but for the average voter, whoever that happens to be, does it matter to them? Should it matter to them? It should matter. I really, truly believe it should matter. I do think that journalists are supposed to hold politicians to account and if no one is holding them to account, who is watching to see how they are spending money and what policies and reforms they are making? I think that it's an important part of democracy to have journalists asking questions. Written by Jason Vermes with files from CBC News. Interview produced by Ashley Mak.